NEW YORK WEST is located in an 1880's Victorian home on Symphony Circle in Buffalo, New York. The Circle (as it was named before 1950) was designed by Frederick Law Olmsted as part of the parks and parkways system in Buffalo. 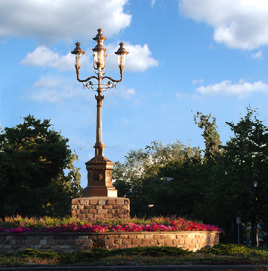 Recently the circular-shaped park has undergone a complete restoration, including the installation of the center island and a replica of the original gaslight that had been bulldozed away many years ago.